It is a small to medium size tree 36 to 65 feet tall, with deeply furrowed bark and thorny branches. The trunk is usually short and divides into several prominent limbs with upward arching branches. The root system is diffuse and covers large areas with its lateral spread. Leaves are deciduous, simple, and alternate or are in clusters at the end of short spurs. Their shape ranges from broad-ovate to ovate-lanceolate, rounded to subcordate at the base broadly cuneate or acuminate at the apex. Leaves are 2 to 5 inches (in.) long and 0.75 to 2.5 in. wide and have entire margins. Leaf blades are dark green, smooth and waxy above; paler green with a few hairs beneath. The color turns translucent yellow in the fall. Osage orange trees are dioecious and wind pollinated with flowers appearing in mid-May to June, after leaves. Staminate (male) flowers are globular or in short cylindrical clusters, green, hairy, with 4 stamens and large yellow anthers, but no petals. Pistillate (female) flowers are in dense, globular clusters, 0.75 to 1.0 in. diameter at the base of a leaf. The fruit or “Hedge ball” is produced in September and is a multiple fruit consisting of many 1-seeded druplets fused into a globose, yellow-green structure approximately 3 to 5 in. in diameter. Female trees may start to bear fruit at about 10 years old. The individual oval-shaped seeds are embedded in the fleshy calyx and are 0.3 to 0.5 in. long. Seeds are initially cream colored but will turn brown with age and exposure to air. Osage orange has the potential to invade areas abused by poor management and the overgrazing of pasture and rangeland. This plant may become weedy or invasive in some regions or habitats and may displace desirable vegetation if not properly managed. 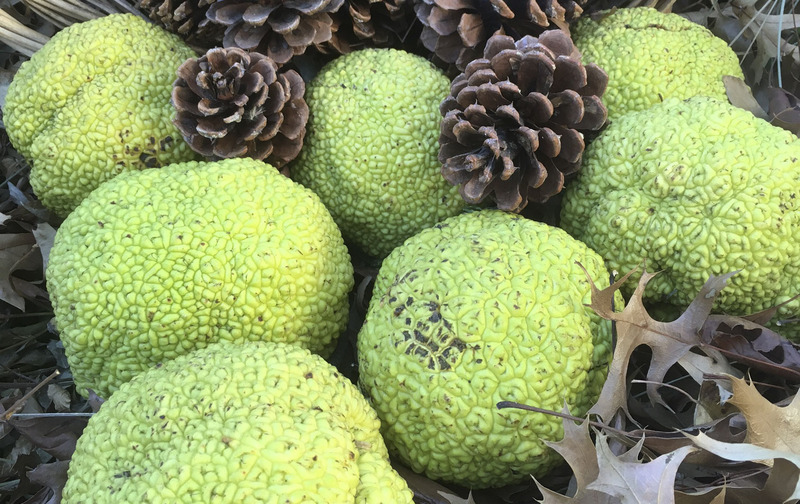 Osage orange has a long and interesting history of use by both Native Americans and early pioneers. Its wood was once in demand for making hubs and wheel rims for horse-drawn wagons, mine support timbers, posts and many other uses where decay resistance was important.